This is Part 2 in the three part series from Sage Dynamics covering Support Hand Only Hand Gun Skills. In part one (of three) of Support Hand skills, we looked at drawing the handgun. This week, we look at reloading (both tactical and slide lock). 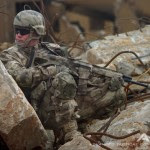 We all know that if you press the trigger enough, the weapon will eventually run out of ammunition (faster in New York than anywhere else) and we do not want to be out of ammunition any longer than we have to. Support hand reloading is going to be slower because we are forced to do everything with one hand, but slower does not have to be slow. The mechanics of reloading remain the same (both tactical and slide lock), it’s the method of reloading that must be practiced to proficiency because we only have one hand to do it with. There are more than a few methods that are effective and we will come to them here, but first I want to address the “Tactical Reload.” Anyone ten minutes into firearms training should know about the tactical reload. 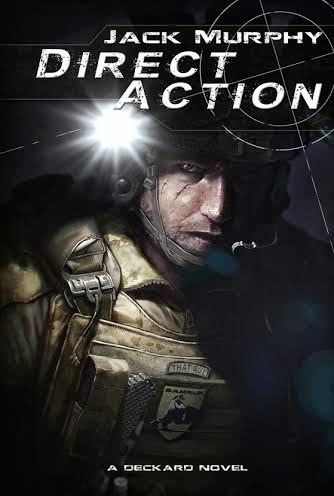 At some point in an exchange of gunfire, there is a lull in the fight; your threat has gone to cover, disappeared or you have otherwise reached a point where it is safe to exchange a partially expended magazine for a fresh one. You don’t know how many rounds you have fired but it is somewhere between one and almost all of them. Using your support hand only presents a few problems when it comes to the tactical reload, the largest being that we want to, if possible, keep the magazine that is in the weapon because it still has ammunition in it that you may need. In order to retain it, you ideally need to secure the weapon in a way that allows you to empty your hand long enough to extract and stuff the magazine in a pocket or pouch before inserting a fresh mag. You of course can use your traditional method of tactical reload as your support hand is the hand you perform reloads with anyway, just keep in mind that you will need to secure the handgun first (in the methods described here) as well as possible because there is a stronger chance of losing control of the handgun during a tactical reload than there is with a slide lock reload. With that covered, lets look at reloading techniques. This is possibly the most secure method (depending on your weapon type/configuration and holster) and the fastest way to retain a magazine during a tactical reload. 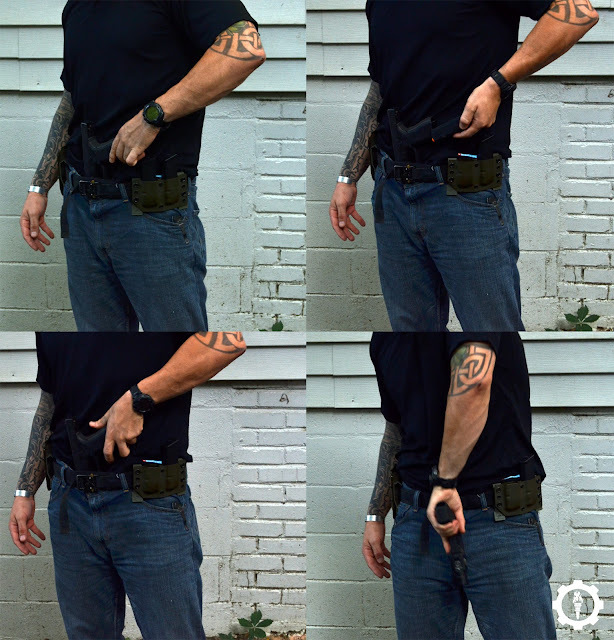 The In-Holster method is nothing more than reaching across your body and holstering the handgun backwards. 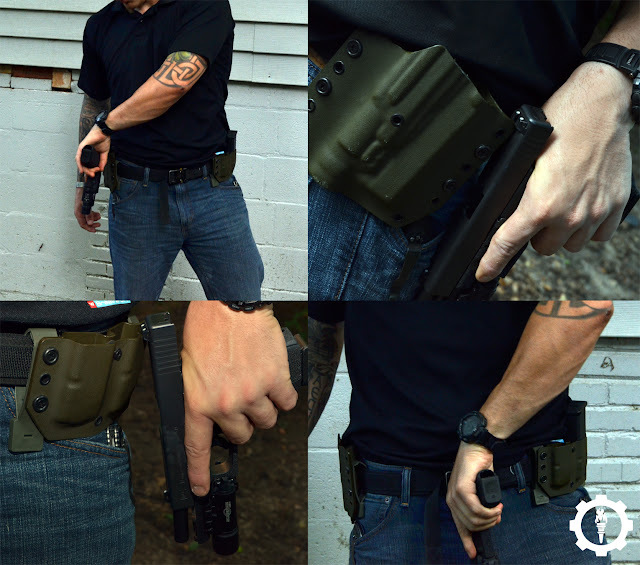 The majority of holsters will accommodate this easily, especially OWB holsters. The spent magazine can be ejected beforehand or after (in holster, simply strip and discard unless the magazine has ammo which should be retained). With the handgun secured, you can index and reload. To close the slide you can either use the slide release (if equipped with an ambidextrous release) or you can rack the slide forward by using the rear sights to catch off any rigid surface; holster edge, magazine pouch, belt buckle, etc. 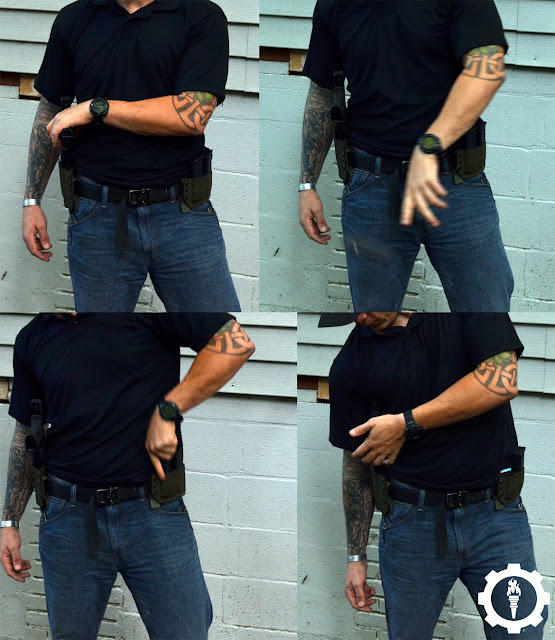 This method is not as effective with IWB leather/nylon holsters because under belt pressure, the holster may collapse and make insertion of the handgun difficult if not impossible, wasting valuable time. Also, speaking directly to those who use SERPA holsters, I would advise against this method because the SERPAs design tends to bind around the handgun when it is inserted rearward (especially with the slide locked to the rear) and may not come free easily (or at all) without significant struggle. If you use a SERPA, practice this method well before relying upon it. The Arm Pit method is straightforward and quick. If you have the ability to compress your upper arm against your torso (a real life injury to your primary hand/arm may prevent this) you can secure the handgun in your armpit, high against your ribcage and perform your reload easily. In the event that your primary arm is totally disabled, those more flexible shooters may be able to pin the handgun under their support side arm pit by sweeping the gun around under their arm. Just like the method of drawing the weapon, the handgun can be reloaded on the deck by pinning it under a foot in a kneeling position. This is best done from a cover position where the terrain will allow it. As an alternative option, the handgun can be pinned behind the knee. Also similar to the un-holstering method, Between the Knees allows you to pin the handgun between the knees/thighs and slap in a fresh magazine. 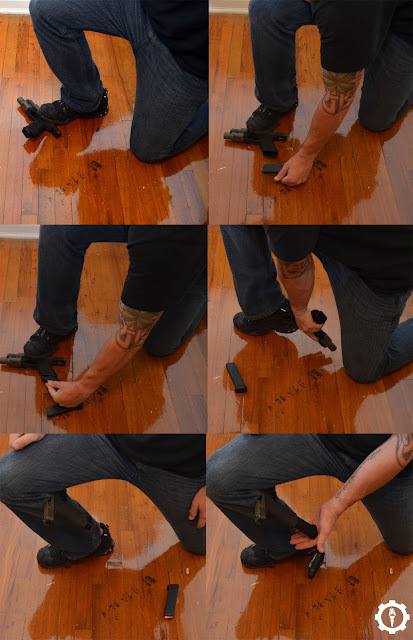 This method does run a risk of dropping the weapon, as forceful pressure to seat the magazine may dislodge the handgun and cause you to drop it. Exercise caution with this method. Tucking the handgun in your midline belt is a fast method to both reload an empty weapon and perform a tactical reload, though not without muzzling yourself in the process. If you Appendix carry then you are already comfortable with muzzling yourself so this may be a good choice for you. 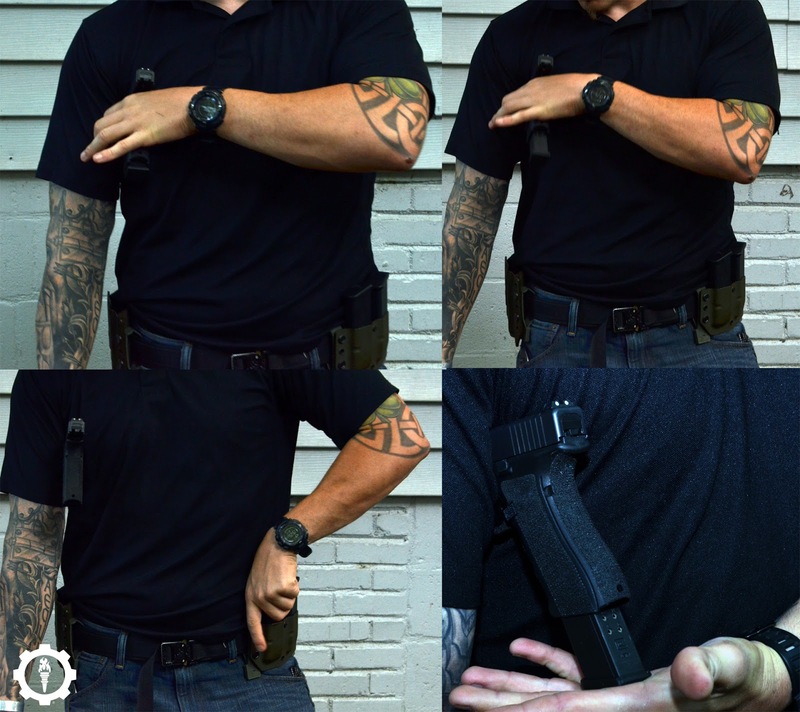 If your primary hand is your left hand, using your support hand to close the slide is as simple as thumbing the slide release, or if your handgun has an ambi release (as already discussed) closing the slide is a simple affair. Outside of that, use your imagination and practice as many methods as you can think of in as many positions as you can think of. Basically it comes down to problem solving and the creation of new methods to fix the problem if those you have been introduced to do not work for you. I have given examples of a number of reloading techniques though these are by no means the only methods that are efficient. 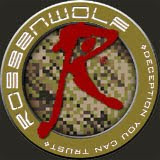 Your equipment, holster, carry method or environment pay present many other prudent methods for reloading and I encourage you to create some of your own.